Admittedly, I was really rather nervous in the lead up to interviewing Judas... Not because they're frightening... far from it, actually; they're genuinely four of the nicest guys. The reason for my serious case of the jitters was the simple fact that I've never interviewed a band before- or anyone, for that matter- and I had absolutely no idea how things would pan out. My main worry was that I'd make a complete fool of myself and spend the entire time stammering... after all, these guys have probably sat through plenty of interviews in their time as musicians, and I wanted to live up to their expectations, whilst making the interview as interesting and fun as I possibly could. Suffice to say the experience has definitely helped me grow in terms of my confidence in being able to do this and I'm incredibly grateful to Judas for allowing me to conduct my very first interview in a freezing cold car park in Barnsley... it was definitely an experience I won't forget! 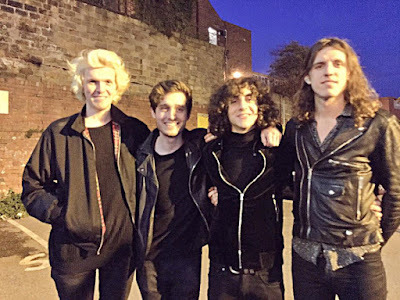 Judas are a four piece from London made up of frontman John Clancy, guitarist Todd Blackmore, drummer Sam Horvath and bassist James Phillips. With a new EP on the way (expected to be released later this month) the band can be seen touring relentlessly up and down the country, proving themselves as driven and creative artists with an apt ability to put on an extraordinarily unforgettable live show. 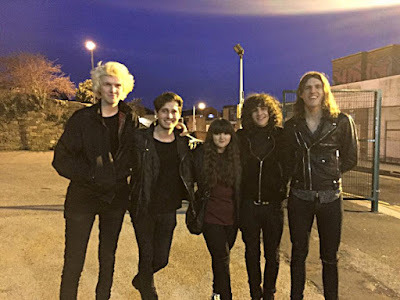 When I met up with them for a chat before their recent gig in Barnsley, their infectious personalities' and wicked sense of humour immediately became clear to me and I instantly felt at ease in their company. How did Judas first come about? Sam: When we found honest faced Todd on social media! Todd: We just looked each other in the eyes and we just fell in love. Sam: We went to our studio in Camden and we just started jamming, and it worked out... and here we are in a car park in Barnsley! Todd- did you know the guys before you joined the band? Sam: We went to the same college but we didn't know eachother. We were actually in the same year and everything. Sam: It was a long process finding Todd. It took us about 6 months in all. John: We had to go through about 40 guitarists. We whittled it down to two- it was like "Who should we pick?" Todd finished his audition and he was amazing, and this other guy was really good. We were like "Who should we pick?" and the guy went "I'll just check if I can be in this band, I'm not too sure," - not you then mate! So then it was Todd. Do you have a favourite place/venue to play? If so, why? Sam: Yesterday was great. (the band played Bodega in Nottingham) We love students unions as well... Epsom, and Newcastle. Tramlines in Sheffield, at the Frog & Parrot, that's always popular. James: I always love a good show in Camden, though. We don't have to drive home! How important do you think social media is to bands these days, and how has it helped you? John: It's more important than writing hits, I'd say. Todd: You get people that can just get famous, even if they're not amazing, if they have a good social media backing they can be big themselves. Sam: Not even just for saying "Oh, we've got a gig tonight", even while we're in rehearsals, and just letting people know we're still a band... and showing people how funny we are! Does the new EP differ from your previous work? Sam: 100%. It still sounds like us, it's just a new and improved us. It's a lot different. John: It's more advanced. The foundations are still the same, but the post production is bigger. There's more strings and keyboards. James: There's more than just us on the record. Sam: It depends how long the post production takes. James: At the end of March we thought it was going to be out in April! John: I think we're gonna do a single release first, not just an EP. It's not in our set yet, we've been saving it. We don't know how to play it yet! What do you listen to in the van when you're travelling between gigs? Sam: We have a little game called Superstar D.J. On Spotify we all get to queue one tune, could be anything, and then we play them four in a row and we all vote for whos' we think the best tune was. Whoever wins that tune gets a point. John: Whoevers' got the most points by the time we get out is the Superstar D.J and they get to make the rules up. Todd: We had 'Chico Time'! Todd: We don't mess about! Sam: The van music is probably the backbone of the tour. What are your rehearsals generally like? Do you have a set time per week in which you practise or are rehearsals more spontaneous? Sam: 12-6 every Monday, and Wednesday. James: Last night we stayed at our friends' house and at 12, after getting up and having breakfast, we just set up all our gear and wrote a song. It's whenever and wherever. Sam: Most weeks we rehearse twice a week. We rehearse the set and then try and write a new song. If you could choose to provide the soundtrack to any film/television series which would you pick and why? Sam: I want mine to be 'Kill Bill'. John: I wanna do a horror movie BUT I'd also like to do 'Game of Thrones'. Just as the guy dies, Joffrey, I'd just do a massive solo- that'd be amazing. Todd: 'Sons of Anarchy' is mine. James: I'd really like a horror film, or 'I Love You, Man' because that's my favourite film. If you don't pick your favourite film, you're not really a faithful man. What do you all do outside of the band? Todd: I've got uni so I'm chucked up with work whenever I'm not with these guys. Sam: We're slowly getting closer to just doing music full time, which is nice. We're not there yet but we're nearly there. That's going to be a dream come true. How do you think you've evolved as a band since you started out? John: (pointing to Todd) We've got his honest face now! We write better songs and we all know what we're doing now. Our shows are better, and I feel like we're more confident. Sam: I think Todd was the missing piece of the jigsaw! The more gigs you play, the more comfortable you feel when you get up and set up and you're there ready to play. James: We're a lot more consistent with shows. Now that we're doing like two shows every weekend, we're driving up and down the country and we're getting used to that which is nice. Sam: When you're driving for seven hours for a show there's no use turning up and not putting everything into it. Finally... where do you see yourselves in 5 years time? What would you like to think the future holds for Judas? Sam: On a beach with a pina colada with Scarlett Johansson. John: Basically doing what we're doing now but with a bigger stage. Sam: Bigger audience, bigger stage, better songs- and a better van! And the same amount of hair!